In the earlier days of plastic modeling, one could get by with an award by simply mimmicking the box art. As more in-depth research was done and more reference information and data surfaced and was published, eyes became more critical; accuracy and realism began ruling the scene. The recommended reference works below are but a few available in the sea of modeling and historic data. However, in spite of, in many cases their out-of-print status and subsequent higher cost, they are still considered the key works that would make important and valuable additions to the serious enthusiast's library. In the early 1970s, Donald Thorpe published Japanese Army Air Force Camouflage and Markings of WWII as well as his Japanese Naval Air Force Camouflage and Markings of WWII, which provided much breakthrough information on a relatively mysterious wartime participant. The pair of books provided camouflage data, unit markings, and a wealth of rare photographic evidence to support the findings. They are scarce to come by, commanding between $75 and $150 each in hardcover on abebooks.com and alibris.com; softcovers can be had for $30+ each. Japanese Aircraft Interiors 1940-1945 by Robert Mikesh is the source for the office end of Japanese aircraft. Published in 2000 and lushly illustrated with color and black and white photos and drawings, the 328-page book provides the necessary research for superdetailing as well as restoration work. In spite of the relatively recent publication date, this book has become highly sought after, bringing between $250 and $350 on Amazon.com. Ducimus and Doubleday produced in the early 1970s two references on RAF and American aircraft of WWII. Camouflage and Markings provided intricate data on insignia placement and modifications, camouflage patterns and colors for 12 individual aircraft in the RAF book; 10 in the USAAC book. Originally, each aircraft was available in a seperate pamphlet, but some of these have become exceedingly scarce and expensive. The hardcover combined versions are available through abebooks.com for between $70 and $80 each. The Squadron/Signal in Action series of booklets on specific aircraft and armor began their release in the late 1960s. Covering all eras of the air, sea and ground wars over the last century, the 'in Action' series has been widely praised for its accurate data, photos, line drawings and color profiles. There are over 200 titles in print, with most of them available at hobby shops or through the web for between $11 and $15 each; a bit cheaper on eBay. Osprey of England has over the years produced an exhaustive and well-respected series of booklets on aircraft, armor, soldiers, and campaigns throughout history. These are highly detailed in their coverage of the subject and will provide the modeler and enthusiast with a wealth of historical as well as camouflage & markings data. Titles are available on the web or from their website at http://www.ospreypublishing.com/ and run between $15 and $35. In the mid-1970s, a series of three volumes covering the 10 years of German aircraft production during WWII was released. Titled Luftwaffe Colors, the series broke new ground with fresh photographs, color plates and line drawings covering, as the title indicates camouflage and national and unit markings. Out-of-print today, the three volumes command individual prices that range between $80 and $140 on abebooks.com. Originally published in 1980, a few years after Sheperd Paine became famous for his remarkable diorama brochures included in Monogram's line of large aircraft and armor kits of the mid-1970s, How to Build Dioramas described in greater detail his methods toward a memorable end. The book covers many areas of planning, layout, construction and detailing. A second printing in 1994 increased its availability and can be obtained for between $6 and $12 on alibris.com. Master Modeler and businessman Francois Verlinden developed a painting technique that grew in popularity. The Verlinden Way - On Plastic Wings was his 'soup to nuts' instruction booklet for building a modeling area, acquiring tools, and all aspects of construction, detailing, painting, and diorama techniques. Largely illustrated in color, this 96-page softcover booklet is a helping hand to all serious modelers. Available across the web for around $15. Francois Verlinden also released a series of 48-page, glossy color booklets covering several dioramas each. Verlinden Modeling - WWII Aircraft Dioramas gave clear and concise instructions in some cases, or simply descriptions in others on the construction of attractive dioramas. Worth the price for ideas and techniques, the series of three booklets can each be obtained for between $10 and $15. 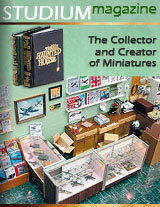 FineScale Modeler magazine replaced Scale Modeler in the 1980s as the modeler's magazine. Filled each month with impressive works of all types and genres, including step-by-step, how-to procedures, FineScale Modeler makes a significant leap in helping to improve the modeling hobby. Issues are available at newstands, hobby shops and bookstores everywhere, but can be subscribed to through their website at http://www.finescale.com/fsm/. Miniature Books - 4,000 Years of Tiny Treasures, published in 2007 provides the collector and enthusiast of miniature books with a sweeping history from small, carved tablets from ancient times through the current fad of super-miniaturization at virtually the atomic level. Lavishly illustrated, this book is a must for any who share an interest in literature in miniature. The book can be obtained through amazon.com at $26 or used for as little as $10. Kalman L. Levitan 1985 reference book, In Search of Miniature Books provides the reader with annotated bibliographic references to miniature books and includes an index of authors. Only 68 pages in length, the publication was limited to 500 copies and trades on alibris.com for between $300 and $400.